It is called ‘Don’t Drink Darling’ (naturally). Black Mail is an Urdu film released in 1985. The movie was an Urdu version of a bloody Punjabi action film. The cast included the two great alpha males of Punjabi cinema, Sultan Rahi and Mustafa Qureshi, and followed the essential fisticuff and revolver driven story of violent revenge. Blackmail plays a rather insignificant part in the fast-paced plot line. 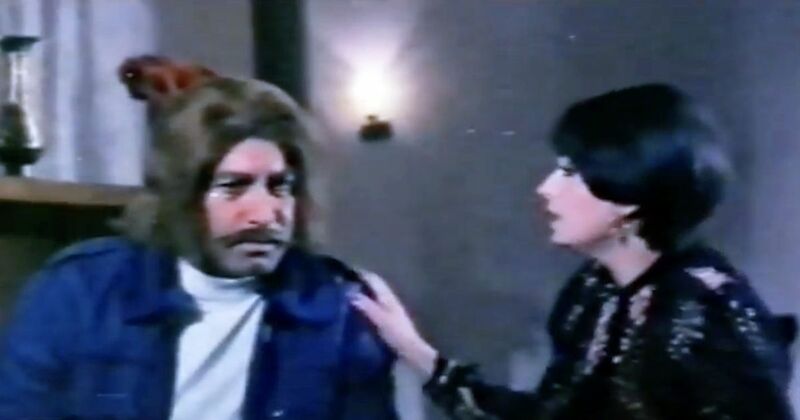 Apparently gangster Dara, played wonderfully with a Clint Eastwood type sullen bravado by a blonde-wigged Mustafa Qureshi, has blackmailed the despicable and amoral industrialist Sethji (Qavi) but it’s not clear. Both leads toss the word around from time to time, but the real driving forces in this game are greed and revenge, with love coming in a distant third place. Roshan (Ghulam Mohideen) was blinded by Dara. While walking in a park one day, he is slapped by a doctor named Najma (Shehnaz), who doesn’t recognise that he is unable to see. Tormented by guilt, she vows to fix Roshan’s eyes and give him sight at last. 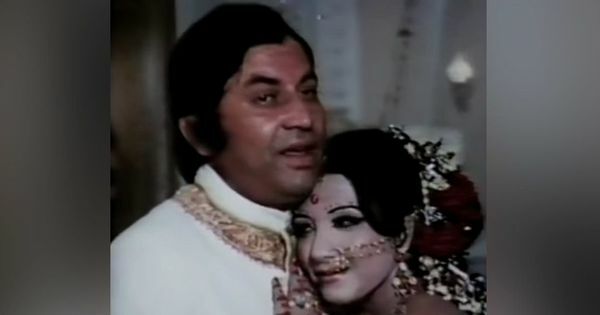 In the meantime, and for most of the middle hour and a half of the film, Sultan Rahi, who plays the good-hearted, rough speaking, matchstick-chewing goonda, has a series of fights with Dara and his henchmen. When they are not fighting each other they take turns scaring the living daylights out of Sethji and eagerly grabbing the vast sums of money he throws their way. Roshan’s operation is a success. But when he discovers that the murderer of his family is Dara, he puts his eyes to use to plot revenge rather than gaze longingly into the eyes of Najma. Black Mail is a bloke’s movie. The action centers around four angry and emotionally stunted men. More so than in many other Urdu movies the women play almost entirely facilitative roles. Nazli does nothing but dance and sing for Raja. Even Shehnaz, whose role as Najma is slightly more complex (but not much), appears only to drive the action forward and enable Roshan to exact his bitter revenge. Most marginalised is Julia, Dara’s girlfriend who appears just once and that to sing a song. Don’t Drink Darling, Black Mail (1985). The song has received considerable coverage in the West in the past several years and it’s not hard to see why. Music Director Kemal Ahmad has concocted a bubbly sound full of synths, congas and what sounds like a harpsichord. Lyricist Taslim Fazli’s ploy of dropping in one English word at the end of several verses –warning, shining, morning – is both clever and humorous. Nahid Akhtar sings with a gusto and energy that more then compensates for the rather awkward and sometimes out of sync movements of Julia. Nate Rabe’s novel, The Shah of Chicago, is out now from Speaking Tiger. A version of this story appeared on the blog https://dailylollyblog.wordpress.com/ and has been reproduced here with permission.